750ADM-AL lead set is 3-meters long, recommended for use with a 230 Volt Supply. 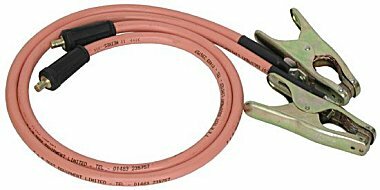 A 1.5 meter lead set is also available, and is recommended when operating from 110 Volt Supply. The leads consists of double insulated 95mm2 welding cable terminated in Dinse high current connectors at the 750ADM end and high current welding clamps at the load end. A set of 5-meter longlow current auxiliary and timer leads are also included with the 750ADM-AL lead set.